For this blog post, I am continuing your virtual tour of the rain forest of Costa Rica. As I mentioned in the last blog post, we were there for a full week and saw so much that it is just too much for one post. This post shows the variety of what we saw in a couple of days. On the third day, we got up early in the morning and walked to the pier where a large fishing boat was waiting for us. Crocodile Bay is mostly known for fishing, but as each boat came back from fishing, they would report whale sitings. So we decided to got out and see if we could spot these massive creatures. For this adventure, I started with my Canon 1D X Mark II with the Canon 100-400mm lens, figuring that I would need the fast burst mode of the camera and the long reach of that particular lens. Before we even left the bay, I turned around and saw this pretty scene along the coastline. I was intrigued by the many different layers in this landscape. I loved the foreground trees lit by the morning sun, the shaded trees behind them, the low hanging clouds creeping through the foliage and then the higher clouds. Since we had spent a couple of days photographing the birds of Costa Rica, I decided to continue that with some photos of the Brown Pelicans which were flying around the boat. One of the easiest ways to spot the whales was to watch for their spouts. About 20 minutes after we left the pier we spotted whales, and they were pretty close to the shoreline. Look at how high their spray reaches up into the air. That has to be 25 feet or more! We spotted 4 large whales and at least one baby. A couple of minutes later, I got this shot of the a tail from behind, with the water falling off the fins. And yes, we still had birds flying around us. After an hour of whale watching, the our hosts decided to put some bait on the lines and see if we could grab some dinner for the evening. Just minutes after dropping the lines in the water, we had a Jack on the line, and they handed the pole to my wife, Annette, to bring it in. I quickly switched lenses to the Canon 16-35mm to grab photos on the boat. This fish went back in the water, but we did pull in a couple of Snapper later in the morning. Other boats caught Tuna and we had some amazing fish for supper. Using the wide angle lens, I got down low and shot images of our fish guide as we cast lines into the water. For this shot, I changed the ISO of my Canon 1D X Mark II to 100. At f/7.1, this gave me a shutter speed of 1/400 sec. I wanted a slightly slower shutter speed to get the motion of the pole as he cast out. The next day, we made our way up into the hills to visit a guy who wrangles snakes and other reptiles. Before we reached our destination, we stopped to photograph this scene. This is a panorama taken with my iPhone. Simple, but beautiful. Then we got to our destination to photograph reptiles in a more controlled environment. Now, at this point you might be thinking, why would I want to photograph in a controlled environment? My goal for the upcoming workshops is to have a good balance of animals in the wild and controlled environments. I want this because it allows me to teach more and it is also a great way for my guests to get great shots for themselves. Oh, and I would rather photograph poisonous snakes in a controlled environment than run into one in the wild! We started by photographing an Eyelash Viper. This little snake is very poisonous. The wrangler carefully put the snake in this plant for us. I used the Canon 100mm macro lens on my Canon 5D Mark IV for most of my photography on this day. So yes, I was pretty close to this snake, but never at an unsafe distance. Then we moved to my favorite reptile in Costa Rica, the Red-eyed Tree Frog. The wrangler had caught a couple of these frogs the night before, so that we would have good subjects for this morning of shooting. I started by taking macro shots of the tree frogs handheld, and then eventually grabbed my tripod to assure the best focus possible. I just love the colors in these little frogs. As the frog moved around from one plant to another, we followed it with our cameras. This is one of my favorite photos from my trip. Once we captured a whole bunch of great photos in the controlled environment, we headed into the rain forest for some shots in the wild. Our guide found this Reticulated Glass Frog hiding under a leaf with a bunch of it's eggs. These glass frogs are amazingly transparent. Most of the color you see in the frog in this photo is coming from the leaf below the frog. As we approached a nearby tree, we saw this Green and Black Poison Dart-Frog. Since there is not a lot of ambient light in the rain forest, I cranked up the ISO of my camera to 3200, which gave me a shutter speed of 1/30th of a second. I leaned against the tree and held on a steady as I could, and grabbed this shot of the frog in it's own environment. As we walked along the muddy path, the guide was walking ahead of us, going through the brush looking for cool wildlife. At one point, he climbed a wall of dirt and found this Golfo Dulce Poison Dart-Frog in a dark hiding place. He asked me if I wanted to climb the same wall for a photo. He then talk us that this was a rare sighting at the poisonous frog had it's tadpoles on it's back. I could not pass that up! So I climbed up the muddy incline and got this shot. If you look closely, you will see the tadpoles on it's back, which look like slimy stripes. We reached this one waterfall and I thought that it would make a great group shot. So I set up my Gitzo travel tripod (with Acratech ballhead) and put the Canon 5D Mark IV in 10 second timer mode. I focused on the group and then ran into the shot. Once we returned from our hike in the rain forest, we stopped for a lunch break. After having a good lunch (which was prepared for us back at the resort), the wrangler offered to bring out some more snakes. For this shot of the Slender Hognosed Pitviper, I decided to use my Canon 100-400mm lens. This allowed me to get shots that were up close and personal, without getting too close to this guy. The last snake that we photographed was a Rainbow Boa, which is not poisonous. I asked him to put the snake up on this tree limb for photographs. It was fun to follow the snake as it cruised from one branch to another, getting shots like this. And to my surprise, my daughter Ali was willing to hold the boa. We tried to get my wife to hold it, but that was NOT going to happen. Bryce was more than open to holding the snake, even willing to trade kisses with the reptile. Next week I will be posting images from the last 3 days of our trip. If you would like more information on the Costa Rica Photo Tours, click here. Last week was an adventure for myself, my wife and daughter, as we made our way South to Costa Rica for a week. The goal of the trip was to scout out the photographic opportunities on the Osa Peninsula for future photo tours. And as you will see from this blog post and the others to come, this is an amazing place to photograph and experience for yourself. And yes, I will be leading tours to this location starting THIS year! You can see that here. We started our trip flying into San Jose, Costa Rica and spent the day there relaxing by the pool and then enjoying the late afternoon lightning storm. The next day, we headed back to a small terminal next to the main airport and hopped onto a small airplane to make our way to Puerto Jimenez and ultimately, Crocodile Bay Resort. This would be our home for the week and our photographic base. We loved the views from the plane, and even spotted a rainbow over the coastline. Armed with my Canon 5D Mark IV and Canon 24-105mm lens, I was able to get some decent photos out of the window of the plane. The flight also provides amazing views of the rain forest from the air. I saw this meandering river and loved the patterns amongst the trees. This aerial views were so amazing that this flight ended up being the highlight of the day for the family. We got to the resort and got settled into our rooms. We then had a really nice lunch and then walked the property to see what photo opportunities we could find. In the first 5 minutes of our walk, we spotted these two Scarlet Macaw in a nearby tree. It so incredible to see these colorful birds flying in the wild. At this point I had switched to my Canon 1D X Mark II and Canon 100-400mm lens. Since the resort is called Crocodile Bay, we had to check out the crocodile pond. We all walked over and found these American Crocodiles lounging. Just as we were viewing these guys, a light rain started falling around us. But hey, it is the rain forest, and we just kept moving ahead. Across the crocodile pond, there was a tree full of Cattle Egrets. I isolated this one Egret fanning his wings to keep them dry. Once again, we were all captivated by the beauty of these birds. The property of the resort is filled with native foliage, and I had a great time capturing photos of the flowers. I saw the curve and color of this Red Ginger plant and framed this shot. There is a certain simplicity in this photo of a single Zinnias flower amongst the green background. After we toured the property, we headed in for dinner (since it gets dark around 5:30pm by the equator) and relaxed for the evening. The next day we were heading out with Dennis, our guide, for a full day of wildlife photography in the rain forest. While viewing the Lizard, Dennis also spotted this baby Green Iguana in a nearby plant. About half an hour later, we were driving along a remote dirt road looking for monkeys, when we spotted this Northern Tamandua (in the anteater family) climbing a tree. For all my longer zoomed photos, like this one, I was using my Canon 1D X Mark II with the Canon 100-400mm II lens. I kept both of cameras in aperture priority mode, using the best aperture I could get on this lens. At 400mm, this meant that I was usually photographing at f/5.6. I would watch my shutter speed, and if it was too slow or too fast, I would adjust the ISO accordingly. For this particular photo, I also recommended that we all adjust our exposure compensation up 1.3 stops to bring the Tamandua out of the shadows. For those of you who don't understand all this, join me on a trip and you will learn this quickly. The next animal we spotted was a Brown-throated Sloth. I have no idea how Dennis find these animals, since I had a hard time spotting it, even after he pointed his laser pointer at the exact location. But I can tell you this...my daughter was very excited to see the sloth for the first time. As I have mentioned in previous blog posts, I have never really been a "birder", but after being to Africa and Costa Rica, I totally get why people love photographing birds. There are some amazing species out there! Here is a photo of a Yellow-throated Toucan hanging out in the trees above us. Dennis found these two Tropical Screech Owls hanging out on a tree branch. I took a bunch of photos of these two and was happy to have a nice sharp image here. I was editing this back at the room at Crocodile Bay when my wife spotted something that nobody else had noticed. 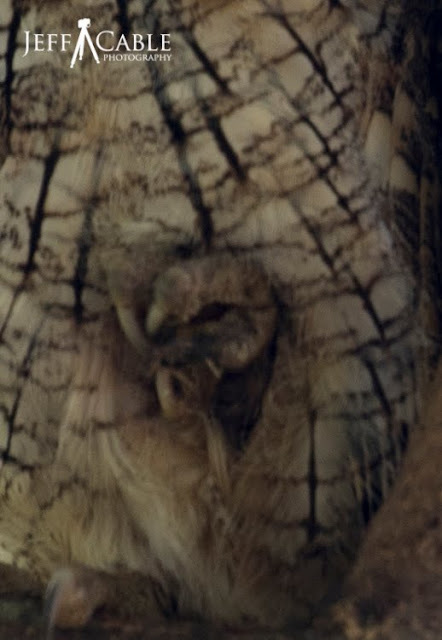 There is a baby owl peeking out from the feathers! Here is a tight crop of the same image so that you can see the baby. The next animal that we spotted was a White-nosed Coati, which is a member of the raccoon family. I had never seen one of these before, and it was fun to capture a new species in my camera. The first species of monkey that we saw was the Black-handed Spider Monkey. They were swinging from one tree to another, and we all enjoyed watching their acrobatics. We drove towards the sound and found these Mantled Howler Monkeys in the trees. I waited for this howler to look up and got this photo with light in his eyes. At one point, while photographing the Howler Monkeys, I looked over and saw Bryan, Bryce and Dennis all shooting at the same spot. I tilted my camera to get all of them in the frame and took this shot of them. Look at that concentration! Almost everywhere we went on the Osa Peninsula, we came across massive amounts of Leaf-cutter Ants. They are really small (they are ants of course) but they are really interesting to watch. These ants are carrying large payloads for incredibly long distances, and many times there are other ants hanging onto the leafs and going along for the ride. I switched back to the Canon 5D Mark IV and Canon 100mm macro lens to get some shots of the ants while the others were capturing more images of the Howler Monkeys. As the afternoon progressed, the clouds and rain moved in. This is very typical in the rain forest, with clear skies for the first half of the day and then afternoon rain showers. But the weather was warm and the rain light, so it does not hinder anything. We stopped by a local beach and I switched lenses on the Canon 5D Mark IV to my Canon 16-35mm lens and took some photos of Ali (my daughter). I also had one of the other guys take a photo of the three of us. Hey - I had to prove that I was there too! As we drove away from the beach and made our way back into the rain forest, we saw another pack of Spider Monkeys. Once again, Dennis pulled over and we all jumped out of the Land Cruiser to see if we could get some shots of these monkeys as they swung on the tree limbs above us. * Many times we are shooting in low light. Even during the day, the heavy foliage in the trees above significantly lowers the amount of ambient light under the trees. * The monkeys move really fast as they move from one location to another. * Often times the abundant foliage gets in between the animals and us and does not allow for a clear shot. * If the rain is falling, it is a challenge to point the lens up high and not get water drops on the front of the lens. * The light behind the monkeys is often times much brighter than the animals so it is tough to meter the subject correctly. Even though all these challenges exist, I look forward to teaching my photo tour attendees the best way to mitigate these circumstances and get great photos. As always, I am using back button focus (servo mode and single focus point) to lock in the focus on the monkey's eyes. These monkeys have the best expressions. I was busy trying to get good photos of one the monkeys when I heard Dennis say "Here comes one with a baby on it's back." I quickly moved the camera to isolate these two and got as many photos as I could, before they swung off to another tree limb and out of sight. At this point, we had seen 3 of the 4 species of monkeys that live in Costa Rica, and we were happy with that. Heck, it was our first full day there. The light was fading and we decided to head back to the resort. ...we saw a large pack of Central American Squirrel Monkeys hopping along a fence. There were probably 20 monkeys jumping from fence post to fence post. If we had arrived about 30 seconds earlier, it would have been an awesome photo. But by the time we got out of the vehicle and achieved focus on these guys, it was too late. But we were glad to see the 4th species of monkey and still got some photos of them in the trees. Overall it was an amazingly full day of photography, and one that I hope to share with many of you in person. I am excited to say that I will be leading numerous photo tours to this same location starting this November. * It is an unspoiled area and it is truly Costa Rica without any large hotels or tourist traps. This is the real rain forest. No ABC stores around to sell you T-shirts. * It is easy to get to Costa Rica from the US with many people having a flight of less than 6 hours. * There is a large variety of photo opportunities for you, including, animals, insects, foliage, scenery, and so much more. * We are based in one locations so there isn't constant packing and unpacking. * The resort is very nice, with great food, great people and all that is included in the package price. * The resort has a conference center with projector, screen and tables where we can all to work together. This is a perfect room for me to teach workflow, Photoshop, and more. There is also a pool and I plan on having at least one informal class there too! * The cost of this trip is very reasonable and therefore more affordable for the average photo enthusiast. * We are limiting the guests to 12 so that everyone can learn. * I have selected great times to visit this location. It is not the height of the heat. 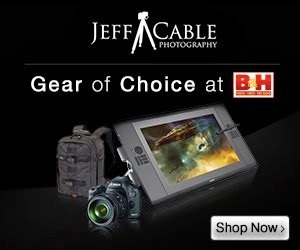 * As I mentioned earlier in the blog, Canon has offered to loan you equipment at no cost to you!